I’m so excited to share this glorious treat with you today. Not only because it consists of brownie-cookies with salted caramel buttercream sandwiched together all whoopie-pie-like, but also because I made these for a very special blog-friend’s “Virtual” baby shower! Krissy from Krissy’s Creations is having a baby boy any day now, and though she lives too far away for an actual celebration, a few of her friends and I wanted to throw her a little “party” to celebrate the soon arrival of Baby. I met Krissy last fall at the Foodbuzz Festival, and given that it was the day after I got engaged, and she was one of the first people I saw after it happened, I’ll always have special memories of that weekend. We both share a love for baking and I’ve loved getting to know Krissy over the last year. I was a bit skeptical of this recipe after seeing the dough. It looks more like brownie batter than cookie dough, but after baking- it turned into the most crackly, fudgy confection ever. I can’t wait to experiment with this cookie. The possibilities for fillings and mix-ins are endless! A party isn’t a party with brownie pies alone, so check out the other lovely ladies and their creations below. Congrats Krissy and Steve! Place butter in a saucepan over low heat and gently stir until melted. Add 7 oz. of chocolate and stir until smooth. Set aside to cool slightly. Place the eggs, sugar and vanilla in the bowl of a stand mixer fitted with a paddle attachment and beat for 15 minutes or until pale and creamy. (I know that seems like a lot, but I think that's what makes this cookie's texture.) Add in flour, baking powder, melted chocolate mixture, remaining 5 oz. of chocolate and mix just to combine. (Don't overmix.) Chill batter for 10 minutes, but not more. Dough should still be slightly gooey, but not watery. Spoon 2 tablespoonful of the mixture, onto parchment lined bake sheet. Bake at 350 degrees for 8–10 minutes or until puffed and cracked. Allow to cool completely on trays before transferring to a wire rack. Place softened butter in a bowl and beat until fluffy. Mix in confectioners sugar and salt, add in caramel and beat until smooth and creamy. Spread or pipe the frosting in between two cookies. Sandwich them together, and enjoy!! I’m so glad I got to meet you and Krissy last year… so sad I won’t be going to Foodbuzz this time around. Seriously in love with these brownie pies! 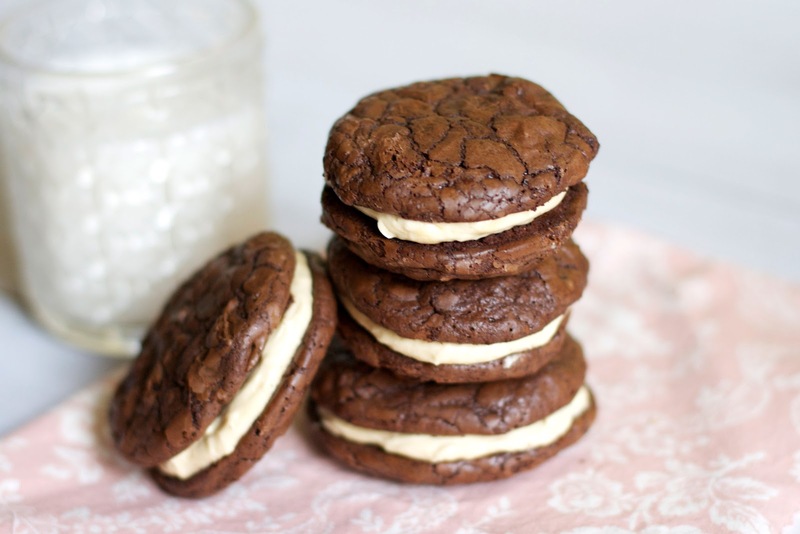 Like whoopie pies–but better! So cool! I so wish I could have met you both too! So happy for Krissy!! These are so fun, Audra, I adore brownies, and the salted caramel is such a great twist! tiny soft brownie sandwiches. I love this! I’d probably eat 5 too! Salted caramel & brownies are a match made in heaven – I swear. I could like live off of salted caramel filling/frostings. I’d just have to always buy bigger clothes lol! How is it that I’ve never eaten a brownie whoopie pie before? This looks totally amazing! Ive been wanting to make brownie cookies for awhile..and these look incredible! And the filling, too!! Wowww these look amazing!!! I’ve never had a brownie cookie but it sounds fantastic! These are so perfect for Krissy! Salted caramel buttercream? You have got to be kidding. Amazing! Wish someone had made these for MY baby shower, ha! Mmm these look so lovely! These look incredible, the texture sounds perfect! How many cookies did you get from the mixture…..? Looks yummy. Hey Clara! I didn’t have a stand mixer until about 2 weeks ago- so I normally would have attempted this with a hand mixer. I think it will work out fine- your hand may just get tired! I hope you mean home-made caramel sauce. I wouldn’t want to mess up a beautiful recipe llike this with commercially prepared caramel sauce. These look and sound awesome! If anyone is wondering, I just made these using an electric beater. My arm was basically dead, but it must’ve have worked because the brownie pies are incredible! 8 – 10 minutes not enough. First batch dough was still raw after cooled. Second batch better with longer cooking time, but too large a portion for me, an avid chocolate lover. Will try again with much smaller “bite” size: should cook in recommended time and with very rich taste, small bites could be better. Sorry they didn’t turn out so well for you. Every oven bakes things slightly differently, so maybe yours needed a little extra time. Mine were pretty big, and done in exactly 9 minutes! Does anyone know how many cookies this makes? I know you have to sandwich them together, but I need to know how many I can expect from one recipe. Thanks. Hey! The quantity totally depends on the size of the cookie. If they are small (1 1/2 inch) it will make 24. Mine were bigger and this recipe made about 18.
these are incredible! the texture of the brownie cookies is awesome. i followed the recipe exactly and was pleasantly surprised with the crinkly top and fudgy inside. i thought with the filling they might be a tad too sweet but not so. definitely making again!